My boy's taste is eccentric. He doesn't like the usual food stuff that other kids like. He eats maki sushi, the one with the raw tuna at the center. I included that in our Noche Buena menu last Christmas. I promised him that I will make him some for school using the left-over Nori (seaweed maki wrapper). 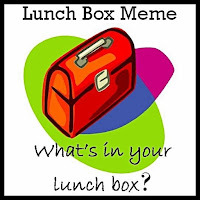 I forgot that the Lunch Box Meme is supposed to be up today. I am so stressed out with personal problems (involving one of my brothers) that I totally forgot about taking a picture of Rap's baon today. Anway, we had Chicken Curry last night and I used that to make Ralph's maki. I found making it really cool because I got to hide the carrots inside the roll. My son isn't that fond of eating vegetables by the way. I cut the left-over chicken pieces into strips. Cut some of the carrots into strips too. I did not use Japanese rice but just our regular dinorado rice. I just asked the househelp to add a little more water to make it softer and stickier. 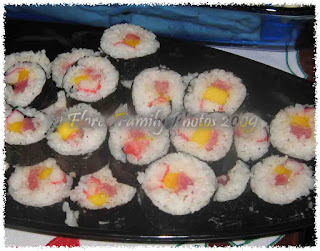 Forgive me for using a picture of my Maki-Sushi from our Noche Buena. But it somehow looked like this except that what Rap had today had cooked chicken and carrots in the center.